You’re sitting across from your spouse. You’re having a lovely dinner, when all of a sudden, something doesn’t feel right. You raise an eyebrow, and casually ask your spouse where the two of you first met. Your spouse laughs and says that you know where that is… and you say….. “yes… I do… please tell me where.” Your spouse can’t answer the question. You then have a choice: you can either prepare for the fight of your life, or you can run like hell. Welcome to Stephen Lloyd Jones’ debut novel, The String Diaries. This is the perfect book to pick up as we head into the annual Halloween creep-fest season! I had much more fun with this book than I had anticipated. Having previously read an entertaining review of the novel from another publication, I decided to give it a try, and I’m so pleased that I did. The String Diaries is a smart thriller that will keep you on your toes until the last page. It’s a story that spans time and generations, and I encourage you to be patient with the format. I’ve seen a few complaints about this book that the timing does not make sense, but I assure you that it will. And I will say right from the start that it will take a few moments to get the hang of a story that jumps from present day, to Oxford in the 1970s, to Hungary at the turn of the 19th century. Sounds bizarre, and it is. But I promise that the moment you have your “a-ha!” moment, the years will fall neatly into line, and you’ll have even more fun with this tale. Your protagonist in The String Diaries is Hannah Wilde (present day), whose family has been haunted (quite literally) by a man from a centuries-old royal family. Sounds odd to be pursued by a man for so many years, but this is not a common man. More monster than human, this immortal creature has the power to change his shape, easily tuck himself into the folds of the lives of his victims, and kill them, if he so wishes. The man’s obsession with Hannah, her family, and her daughter reaches back to the beginning of the 19th century, which means that he’s waited a long time to get what he wants. Other than the oral tradition of storytelling within Hannah’s family, the the only clues to this monster’s history lie within the browned pages of a cache of diaries that dates back 200 years. This “man” is after Hannah, and more specifically, her daughter. It’s up to Hannah to bring this chilling, years-old chase to a halt, and she must be willing to make the ultimate sacrifice to do so. The question is, will Jakab (the pursuer), manage to fit himself into the skin of one of Hannah’s loved ones before she notices? Will it be too late if she does? This tense approach to storytelling works very well in this novel. Not knowing who the reader can trust from one moment to the next made me pick up the book at every available opportunity. Not only does the book have a startling evil vein that courses throughout, but also I found that the story had many heroes. Beside Hannah, the bravery and tenacity of her young daughter, a family friend, her parents and grandparents were enough to propel the story forward with terrific speed. I found that the entire list of characters was brimming with adventure and back story, which made the novel all the more entertaining. I don’t want to give too many details about The String Diaries, because to offer too many glimpses inside would ruin your fun. Just trust that this is a great page-turner with a chilling history and a satisfying end. 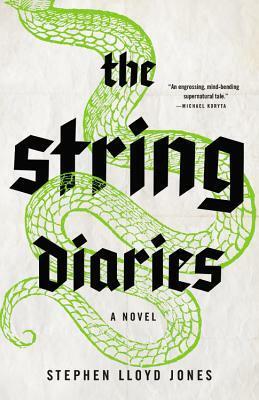 Much to my delight, I’ve recently discovered that Stephen Lloyd Jones has penned a second novel, which will be #2 in The String Diaries series! I’m not sure if I can wait until May 2015 to get my hands on it. I may have to see about getting over to London to get a copy sooner. We Hoarders are an impatient lot. 4.5 stars for The String Diaries.